Genetics - Welcome to The Frog Pad! ﻿Step 1: Determine the genotypes of the parent organisms. organisms have two alleles (one inherited from their mother and one from their father). Step 2: Write down your "cross" (mating) by writing the genotypes of the parents with an "X" between them. ﻿ Example: In pea plants, yellow peas are dominant to green peas. Cross a homozygous dominant yellow pea plant with a homozygous recessive (green peas). Step 3: Draw the Punnett Square, separate the parent alleles and write them on either side. Step 4: Fill in each cell with two allele, one from the parent along the top and one from the parent along the side. The letters in the middle show you all possible combinations of alleles that can happen from mating these two genotypes. Step 5: Summarize the results. 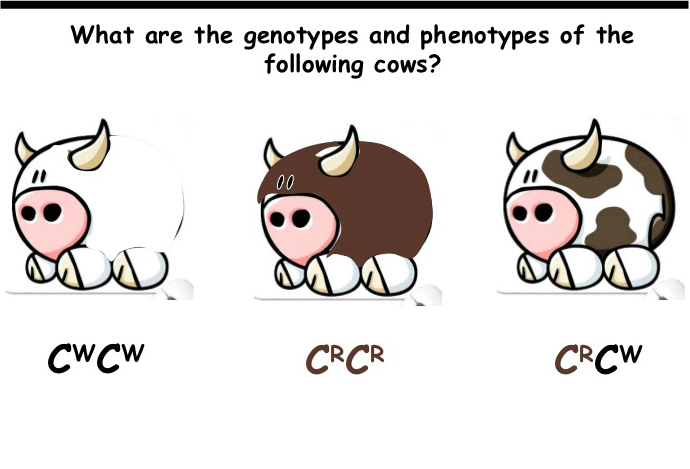 Give genotypes and phenotypes of offspring with the probabilities. In this example, there would be a 100% chance of having plants with yellow peas (phenotype) and their genotypes would be heterozygous (Aa). These punnett squares are for looking at two traits at a time. Biology Corner has a good tutorial. Click here. Suppose you wanted to investigate two traits with the alleles "A" and "a" with "B" and "b". To cross two heterozygous individuals for both traits, use the genotypes AaBb for both male and female. 1) Create the possible gametes, by using the "FOIL" method as taught in class. 2) Put the possible gametes from each parent down the sides and top of a 16-square Punnett. 3) Fill in the Punnett by bringing the gamete combinations together. Keep the like letters together. You may also see dihybrid punnett squares in a diamond pattern. Don't let it confuse you. It's still set up and carried out in the same way. This is a cross of two fish with two traits being studied. The genes being studied are f (fancy tail) and (e) funny eye. Other patterns of inheritance include codominance, incomplete dominance, multiple alleles, and polygenic traits. Some genes have more than two alleles for a trait. 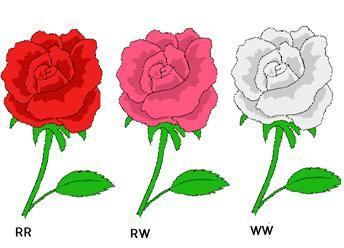 This is known as multiple alleles. Rabbit fur color and human blood type are examples. Mendel thought that one gene controlled one trait. We now know that sometimes a trait is caused by many genes, not just one. This is known as polygenic traits. These traits have a wide range of phenotypes. Examples are eye color, hair color, height and skin color. Zero Biology has a drag and drop pedigree practice. Read the directions carefully. GREAT explanation of how to do a Punnett Square and what it means.